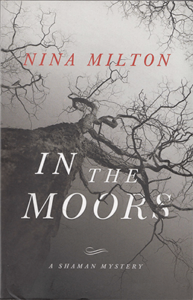 The first in Nina Milton’s ‘Shaman Mystery’ series, In the Moors is a murder mystery with a twist – in more ways than one. Introducing the very likeable, down to earth, shamanic counsellor, Sabbie Dare, In the Moors is a fast paced, compelling and highly original thriller which also contains realistic descriptions of Sabbie’s shamanic journeying work with her guide, Trendle (an otter). Sabbie’s troubled client, Cliff Houghton, is chief suspect in the murder of a young boy after the police find him lurking on the moors where the body was found. Continuing her work with Cliff, Sabbie recovers his disturbing childhood memories, shedding light onto a spate of child murders twenty years earlier. Sabbie’s instincts tell her Cliff is innocent of the crime he is accused of. Then a second child goes missing. In the Moors is a dark thriller, dealing with chilling serial crime but, due to the skill of the author’s writing and the humour and engaging character of Sabbie Dare, it is also a highly enjoyable read that is very difficult to put down once you pick it up. In fact the main issue for me was reaching the end of the book and wondering what I could read next that would match up to it. Fortunately there is a book two and three in the series (although I started the series by reading book three, so also can confirm you can read them in any order). And hopefully Milton will continue the series with a book four. Very addictive and highly recommended!